It's January 1st, 2012 already! My goodness, I feel like 2011 flew by and it was an awesome year. That's just a few of the good things that 2011 brought us, it was a really wonderful year and I hop 2012 is a good one, too! So, yesterday we had dinner with friends at their house, it was a lot of fun, they have two kids as well and our boys played together and we just chatted and had a good time. Today, the 1st, my husband let me sleep in, then we went to the park to feed the ducks and enjoy the sunny day. Little man had a good time watching the ducks and chasing the birds! Then we came back home, ate lunch and later on I had a little boy that was really bored, but my husband and I just wanted to stay home, he wanted to play his video game and I wanted to crochet and cuddle with the baby. 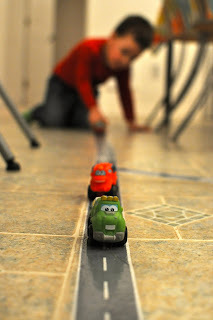 Good thing that Santa had brought him this "road tape"! He has been playing cars for over 2 hours! I made him a parking garage out of a Ritz Crackers box, so the parking garage along with the tape are a total success! I hope everyone have a marvelous 2012! Happy New Year! I hope this year is as wonderful as the past one was to you.